Burton Gin and Museum - Burton, Texas. For some reason we arrived without our video camera so we shot this a video with a small Sony digital camera with a video feature. We were limited to short clips and a small camera that was hard to hold still. But it still turned out pretty good. this is where we found Burton, Texas. The Burton Cotton Gin is the oldest surviving gin of this type. It uses revolutionary late 19th century technology of air blowers and belts to move seed cotton from the cotton trailer through the entire ginning process. The gin is capable of producing one 500 pound bale every 12 minutes. All of the blowers, belts, screw conveyors and bucket elevators are powered by a single power source. When the gin was built in 1914 that single driver was a steam engine using local cord wood as nearby lands were cleared for farming. In 1925 the steam engine was replaced with the Bessemer Type IV oil engine to provide more power and finally in 1963 the gin was powered by an Allis-Chambers electric motor to provide a more reliable power source. In 1973 the Burton Gin ginned only 7 bales of cotton. It was shutdown as it was no longer economically feasible to operate. The Cotton Gin lay dormant from 1974 to 1986 then a group of local citizens decide to save the Gin. They thought it was an important part of not just Burton history but the history of the cotton industry and of the state of Texas. Then the work began. The first step they took was to form a nonprofit corporation to acquire the property. Then they did extensive research and inventoried what they had and what they didn't have of the original gin. Then in 1990 the work really, began. The physical work of over hauling a very old engine and gin machinery with parts that either had to be gleaned from other old equipment or specially fabricated for this projects. 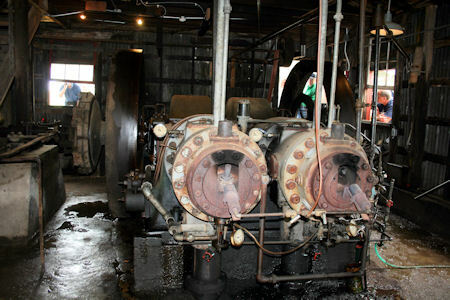 Volunteers spent hours working on the gin or spending a lot of time locating that belt or sheave or oiler that is no longer manufactured. There were others that thought this was an important project and provided different types of support and materials. Those were The Smithsonian Institution, The American Society of Mechanical Engineers, Cooper (Bessemer) Industries and the Texas Historical Commission to name a few. 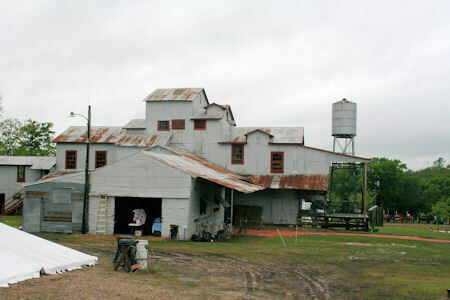 The most important asset to the Burton Cotton Gin restoration was the people of Burton, Texas and Washington County. Every April the citizens of Burton fire up "The Lady B", a Bessemer Type IV oil engine that drives the nearly 100 year old Burton Cotton Gin and they gin a bale of cotton. 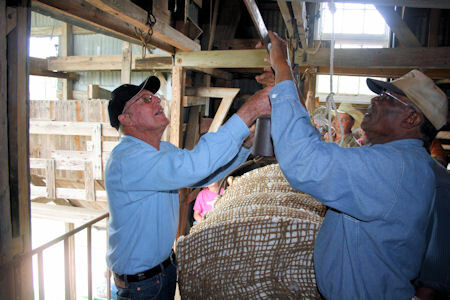 This year (2009) they were baling cotton especially grown for the 20th annual Burton Cotton Gin Festival by 80 year old Mr. Gilbert Janner. All year around you can visit the Burton Cotton Gin and Museum. Gin Tours are held twice a day during museum hours.